* What Can I Play on Sunday? * Complete Collection is a comprehensive resource of easily prepared hymn arrangements for each two-month period of the year. * In addition to seasonally relevant selections for general worship, the book also contains arrangements that are appropriate for major holidays, including Epiphany, Lent, Easter, Pentecost, the Fourth of July, All Saints Day, Thanksgiving, Advent, and Christmas. 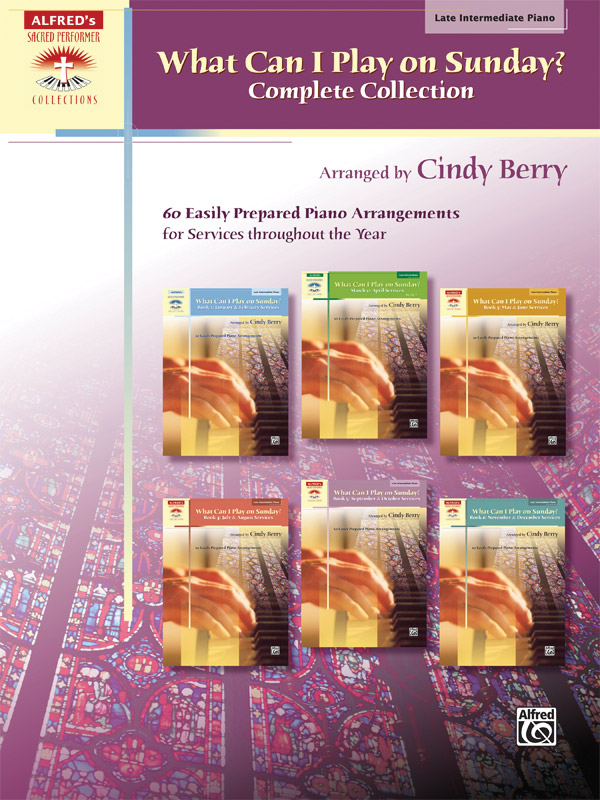 * Perfect for busy pianists with limited rehearsal time, this collection fulfills worship-planning needs for services throughout the year. * Titles: All Glory, Laud and Honor, All Hail the Power of Jesus' Name, Amazing Grace, America (My Country, 'Tis of Thee), America the Beautiful, Be Still, My Soul, Break Forth, O Beauteous Heavenly Light, Brethren, We Have Met to Worship, Christ Is Made the Sure Foundation, Christ, Whose Glory Fills the Skies, The Church's One Foundation, Come, Holy Spirit, Dove Divine, Come, Thou Almighty King, Come, Ye Sinners, Poor and Needy, The Coventry Carol with Away in a Manger, Depth of Mercy with Search Me, O God, Faith of Our Fathers, For All the Saints, God Will Take Care of You, God, Give Us Christian Homes, Hail the Day That Sees Him Rise, Hallelujah! What a Savior, Hark! The Herald Angels Sing, Holy God, We Praise Thy Name, How Firm a Foundation, It Is Well with My Soul, Jesus Shall Reign, Jesus, Keep Me Near the Cross, In the Cross of Christ I Glory, Jesus, Lord, We Look to Thee, Just as I Am, Without One Plea, Let All Things Now Living, Let Us Break Bread Together, Lift High the Cross, Lord, I Want to Be a Christian, Must Jesus Bear the Cross Alone?, My Faith Looks Up to Thee, My Lord, What a Morning!, Now Thank We All Our God, Come, Ye Thankful People, Come, O Come, All Ye Faithful, O Come, O Come, Emmanuel, O God, Our Help in Ages Past, O Word of God Incarnate, O Zion, Haste, O, How Joyfully!, Joy to the World, Rejoice, the Lord Is King, Savior, Like a Shepherd Lead Us, He Leadeth Me, Simple Gifts, The Solid Rock, Spirit of God, Descend Upon My Heart, O Breath of Life, Stand Up, Stand Up for Jesus, The Strife Is O'er, the Battle Done, Take the Name of Jesus with You, There Is a Fountain, There's a Song in the Air, This Is My Father's World, 'Tis So Sweet to Trust in Jesus, We Are Climbing Jacob's Ladder, Were You There?, When I Survey the Wondrous Cross, Where He Leads Me.